Tick Talk » What’s wrong with it? Contest! « How accurate is your cell phone? What’s wrong with it? Contest! All the clues you need are here and in the picture. 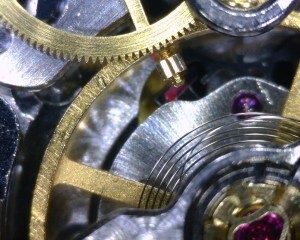 (Feel free to click on it for a larger view) This watch is a Rolex caliber 3135 with low amplitude. What is the problem? And specifically what caused it? What is the fix? I will send a $5.00 giftcard for the WatchmakingBlog.com Store to the first person who precisely answers all three parts to the question above. This entry was written by Jordan Ficklin and posted on August 20, 2012 at 5:16 pm and filed under watches, watchmaking. Bookmark the permalink. Follow any comments here with the RSS feed for this post. Post a comment or leave a trackback: Trackback URL. It looks like the kif spring isn’t installed correctly or has been jarred loose. This allows more play in the balance which is making contact with the center wheel. Note the odd markings on both the balance and the center wheel. I would remove the balance, clean both the balance and jewles and reinstall correctly(of corse with proper oiling too). I think this was caused either by a strong shock or poor work done by a previous service. Yup,Vanessa has it! The balance is upside down! Seen this one before! Probably that cap jewel is on upside down, which created pressure that popped the KIF spring in the first place. Flip the cap jewel and replace the spring. Doe. How did I miss that? Well, Jon threw out a big clue but I’m going to give in to Vanessa. There is one key point missing however. And that is, why does the upside down balance wheel affect the amplitude? does the rim now drag on something? I know you can’t really tell from the straight on picture, but yes. The balance wheel rubs against the fourth wheel. You can actually see scratches in the balance rim from this repeated behavior. This is a real world repair. I don’t know who put the balance in upside down. It wasn’t me. The most recent casemark is from 12 years ago but I don’t imagine it ran like this for 12 years so I’m sure it was somewhere else recently. They came to me to make it work right, and it will. Arggh….the only thing that comes to mind is just the word ‘sad’. Where is the pride/integrity gone in people’s work??? Good on you for making it right/good work J.P. This shows why the CW21 Certification is important to Rolex. The last thing they want is someone saying my watch doesn’t keep time. Wow! Never knew it was even possible to fix the balance upside down. Learn something new everyday!